*E-Light or elos hair removal is the perfect marriage of RF and IPL technology to deliver a more superior laser hair removal result with less risk of hyper or hypo pigmentation in darker skin tones. This advanced technology is a more comfortable & effective treatment than laser or IPL and is the safest option for the delicate bikini and underarm areas. When used on the face E-Light will reduce both dark and fair velous hair. Safer treatment option for darker skin tones. E-Light effectively reduces fair, red & velous hair growth. Laser technicians are trained to manufacturers standards, for a safe laser experience. Overlapping IPL shots means thorough treatment. Adjustable settings to suit your hair colour & skin tone. *Please Note: Prior patch testing is required before all eLight and IPL treatments can be performed. Best results are achieved with a package of 6 treatments. Discounts apply to prepaid packages so please ask your laser practitioner for more information. Reduction of unwanted hair on half the front of the neck. Reduction of unwanted hair on the front of the neck. Reduction of unwanted hair outside the beard line. Reduction of unwanted hair preserving the brows. Laser Hair Reduction with Elos technology for front brief line. Laser Hair Reduction with Elos technology for the inner thigh. Laser Hair Reduction with Elos technology for the half leg. Laser Hair Reduction with Elos technology for the full leg. Laser Hair Reduction with Elos technology for hands or feet. Laser Hair Reduction with Elos technology for the underarm. Laser Hair Reduction with Elos technology for the half arm. Laser Hair Reduction with Elos technology for the full arm. Laser Hair Reduction with Elos technology for the stomach. Laser Hair Reduction with Elos technology for the chest. Laser Hair Reduction with Elos technology for the half back. Laser Hair Reduction with Elos technology for the full back. Reduction of unwanted hair on the chin. Reduction of unwanted hair on the upper lip. Reduction of unwanted hair on the sides of the face. Reduction of unwanted hair on the face preserving the brows. E los hair removal for women’s underarms. E los hair removal for women’s bikini line. E los hair removal for women’s G String Line. E los hair removal for women’s Brazilian. E los hair removal for women’s half arm. E los hair removal for women’s full arm. E los hair removal for women’s half back. E los hair removal for women’s full back. E los hair removal for women’s stomach. E los hair removal for women’s inner thighs. E los hair removal for women’s half leg. *IPL hair reduction is an Intense Pulse Light technology used to effectively reduce and remove unwanted facial and body hair. When administered by an experienced practitioner the risks of over heating complications are low and the result is considerable hair reduction. Reduction of unwanted hair on the full front of the neck. IPL Laser Hair Reduction for front brief line. IPL Laser Hair Reduction for inner thigh. IPL Laser Hair Reduction for the half leg. IPL Laser Hair Reduction for the full leg. IPL Laser Hair Reduction for the hands or feet. IPL Laser Hair Reduction for the underarms. IPL Laser Hair Reduction for the half arms. IPL Laser Hair Reduction for the full arms. IPL Laser Hair Reduction for the stomach. IPL Laser Hair Reduction for the chest. IPL Laser Hair Reduction for the half back. IPL Laser Hair Reduction for the full back. *IPL is a more thorough and effective means of hair reduction. Single beam lasers can miss patches of hair and generally the light frequency used can not be adjusted to suit different skin tones or colours. IPL Reduction of unwanted hair on the chin. IPL Reduction of unwanted hair on the upper lip. IPL Reduction of unwanted hair on the sides of face. IPL Reduction of unwanted hair on the full face preserving the brows. IPL hair removal for women’s underarms. IPL hair removal for women’s bikini line. IPL hair removal for women’s G String line. IPL hair removal for women’s Brazilian. IPL hair removal for women’s half arm. IPL hair removal for women’s full arm. IPL hair removal for women’s half back. IPL hair removal for women’s full back. IPL hair removal for women’s stomach. IPL hair removal for women’s inner thighs. IPL hair removal for women’s Half Leg Upper. IPL hair removal for women’s Full Leg. Is IPL laser hair reduction safe? Yes. IPL light frequencies are non ionizing, which means they do not cause cancer. Many studies have been undertaken without any indication arising that IPL causes cancer. There are some risks involved though that may lead to discolouration or scarring. A good IPL technician will give you all the pre and post treatment guidelines & skincare to ensure you are prepared for every session with little to no risk of over heating. Firstly we choose the IPL hair reduction setting suitable for your skin tone and hair colour. Each IPL shot will target the colour in the root of the hair causing damage that makes the hair fall out. Will my hair grow back after I finish my IPL program? In most cases yes. This is because hormonal changes within the body can reactivate the growth of hair in the area treated. Generally treatment results will last between 1 – 2 years before an IPL hair removal treatment will be needed again. Is'nt laser better than IPL for hair removal? No. Laser hair removal uses a single beam of light to target the colour in the hair that it comes in contact with. Many use Single Laser hair removal because it is quick to perform, unfortunately the results are very patchy requiring many return visits. 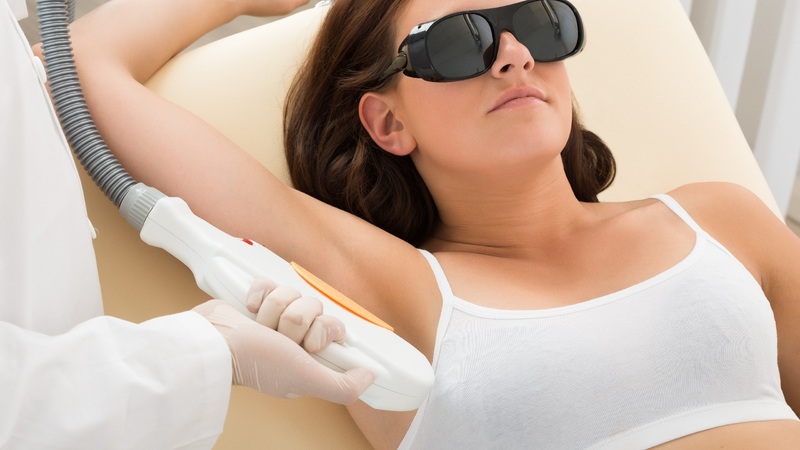 IPL hair removal uses Broadband Light to treat a larger patch of hair in one shot. As the shots are overlapped IPL treatment will take longer to perform & be more expensive, but the results are far more effective than Single Beam Lasers, with less treatments required. I have had IPL before, do I really need a patch test? Yes. It is a requirement by the Qld Government we adhere to safe laser practices. As such consultation, written consent and laser patch testing is required before we can perform any laser treatments on our clients.